Discussion in 'Nike Retro' started by rupertpupkin, Sep 6, 2013. Jimmy Jazz Downtown BK has these. Going to see if I can get these off of Swoosh. Going to have to ask a favor. Im speeding call the cops likes this. Im speeding call the cops and llerraj like this. The Shanghai's and the Seoul's are the most practical but these 98s the coldest putting the white laces in mine. tigo0240, rashad8869 and cragmatic like this. Only on-air pair I wanted and got 'em under retail. Doom., Koncrete Kickz, bossplaya0625 and 9 others like this. Anyone with a swoosh please help me. Please. I’m begging. Im speeding call the cops, coordinate and llerraj like this. freeze, llerraj and vig09 like this. 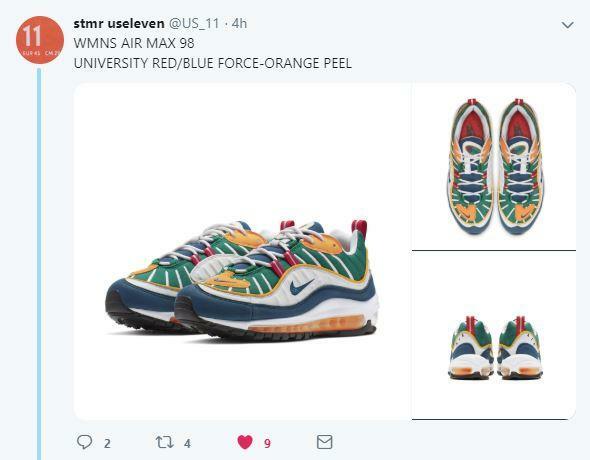 Wish I would've ordered those on air 98s off of swoosh instead of Feature. Iceman92 and AirLoMax614 like this. I showed my girl these (doesn’t know I got them) and she hates them lmao. She just doesn’t know sneaker fashion. qujamerican and vig09 like this. There's a FSR of the 98s on FNL. Since when do they get QSs? Yea ima need these too anybody seen a date??? These and the Kaleidoscope pair are the best. 97's are #1 only because I'm not a huge fan of 98's. The blue laces are mean.. I wonder if they have another set of blue and green laces. These are sick though. Flop or not, if you like the shoe that's all that matters. Try and hit for the Korea's this weekend. I wanted these 98s to win as well. llerraj and Im speeding call the cops like this. Notre ship for anyone yet ? Edit, just got a UPS MyChoice notification that they will be delivered tomorrow. Being that I’m 3 hours away from Chicago, I figured it wouldn’t take long. Excited to see these in hand. Just opened my box and these are underwhelming in person IMO. They're nice, but not worth $200. I'm usually a strictly retail or below kinda guy, but in this case I would feel better paying resell for a pair of OGs than retail for these. I’ll see how I feel when I get mine. Notre didn’t charge me tax at all so I paid 170 flat. I figured for that it was worth it. Hit kixsquare. They cut the price. Hurry. We can all eat!! maximusmmc, jking0821, fr4nch1s3 and 1 other person like this. llerraj and Smithbeentrill like this.